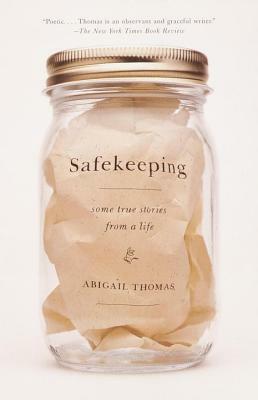 A beautifully crafted and inviting account of one woman’s life, Safekeeping offers a sublimely different kind of autobiography. Setting aside a straightforward narrative in favor of brief passages of vivid prose, Abigail Thomas revisits the pivotal moments and the tiny incidents that have shaped her life: pregnancy at 18; single motherhood (of three!) by the age of 26; the joys and frustrations of three marriages; and the death of her second husband, who was her best friend. The stories made of these incidents are startling in their clarity and reassuring in their wisdom. This is a book in which silence speaks as eloquently as what is revealed. Openhearted and effortlessly funny, these brilliantly selected glimpses of the arc of a life are, in an age of excessive confession and recrimination, a welcome tonic. Abigail Thomas is the author of the novel An Actual Life and the story collections Getting Over Tom and Herb's Pajamas. She lives with her husband in New York City, where she teaches in the M.F.A. writing program at the New School.